First up, a courgette and a zucchini are the same thing. We Brits took the French name and the Americans took the Italian name. Given the romantic languages we use to describe this vegetable it isn’t the one we get most excited about. It doesn’t have the sweetness of corn, or the usefulness of tomato but it is a summer faithful. At this time of the year they are plentiful and they have a nice solidness to them that makes them a great side dish. We’re growing our own courgettes for the first time this year so I’m getting together as many recipes as I can to cope with the inevitable glut. 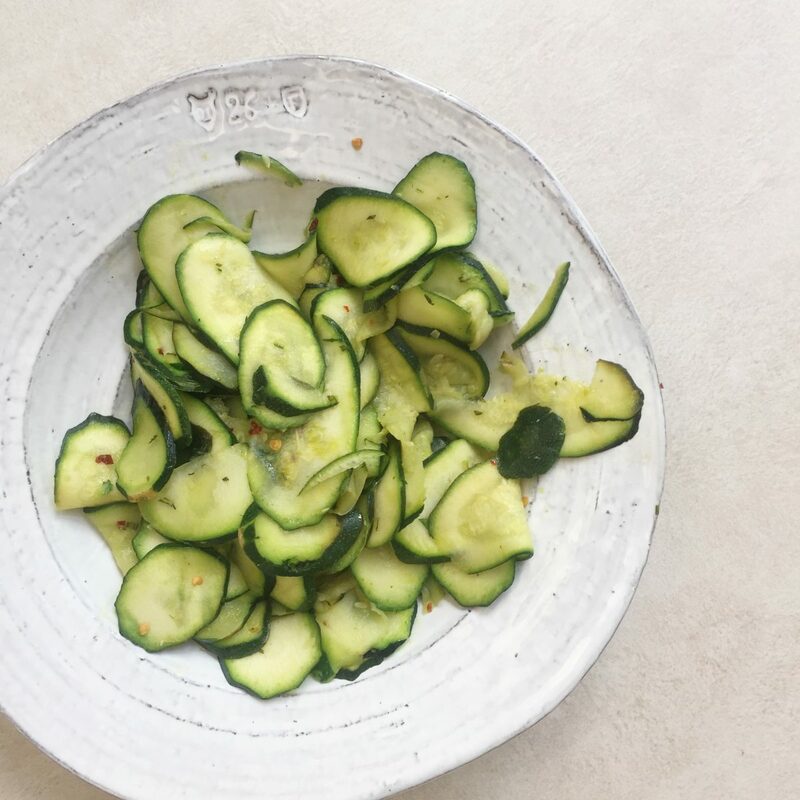 This lemon, garlic and rosemary courgettes recipe takes minutes to make and is great alongside grilled fish or steak. We had it with pan fried halloumi recently and it offset the salty squeak of the cheese perfectly. One of the main reasons I wanted to share this recipe is the reaction I got to the video I posted on my Instagram of me slicing the courgettes. I used the side of my box grater – the bit with two horizontal blades – to get perfect thin coins of courgette. I know most people ignore that side of the grater but it is a brilliant tool and much, much safer than a mandolin. 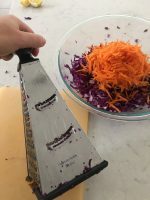 I also use this side of the grater to finely shred cabbage for slaw. Use the horizontal blades of a box grater to thinly slice the courgette into coins. If you are nervous, hold the courgette with a tea towel to protect your fingers. Once the courgette is sliced, peel the garlic but don’t chop it. Strip the rosemary needles from the stem and finely chop them. Heat the oil in a non stick large frying pan on a medium high heat and add the rosemary and whole clove of garlic. Let is sizzle for a minute to flavour the oil then add the courgette slices. Stir fry for 3 minutes until they start to soften. Add the zest of the lemon and the juice of half of it along with around a quarter teaspoon of sea alt flakes, a good pinch of red chilli flakes and freshly ground black pepper. Take off the heat and stir. Taste and add the other half of the lemon juice or more salt and chilli if needed. Serve immediately. Find more recipes for sides and courgettes/zucchini here.